Top » Catalog » Sandstone Necklaces » Hand Carved Crane Pendant. Poise; Balance; Intelligence. Through crane’s grace we find the power to open our souls to the light of the world. 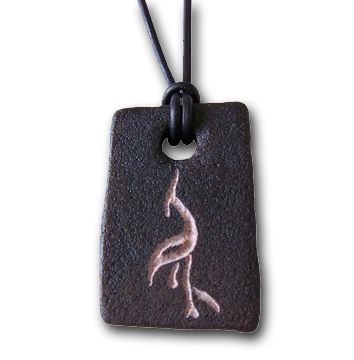 This is a hand carved sand stone pendant created by artist Ron White. It comes with a 34" adjustable black leather cord. Also included is a description card listing the symbolism of the carving. Currently viewing: Hand Carved Crane Pendant.